Cam and his little fellas head into the Best Buy Theater in NYC. There were no Boise State fans. There were no Oregon fans. Ashley Heck says she saw one guy with a Stanford hat that happened to be passing by. 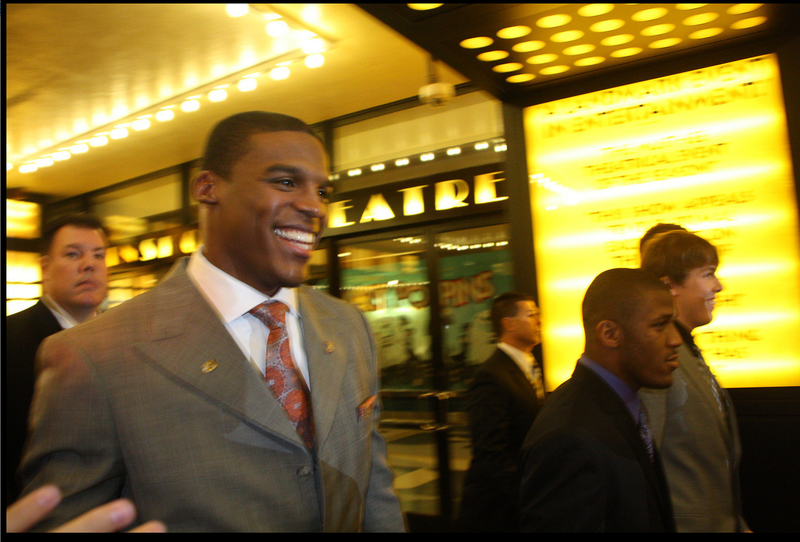 Other than that, the people gathered by the entrance of the Best Buy Theater in downtown New York Saturday night two hours before the 2010 Heisman Trophy Presentation for what was a forgone conclusion were in orange and blue. There were lots of them. They chanted “It’s Great to Be an Auburn Tiger.” They and their digital cameras were there for Cam Newton. And like Newton, the “Heisman Tiger Walk” organized by the New York City Auburn Alumni Club surpassed all expectations. Heck says it was “very satisfying”, but also that she’s still in shock. Depending on whom you talk to, there was at least four times that many… and maybe ten. Heck says it was 400. Nicole Klein, a 2005 Auburn graduate who also sits on the club’s executive board – and who prides herself on her ability to estimate crowd numbers – says 800. Some of them drove hundreds of miles just for a glimpse at the eventual Heisman winner, including an entire family from Philadelphia who brought with them the sign of the night. 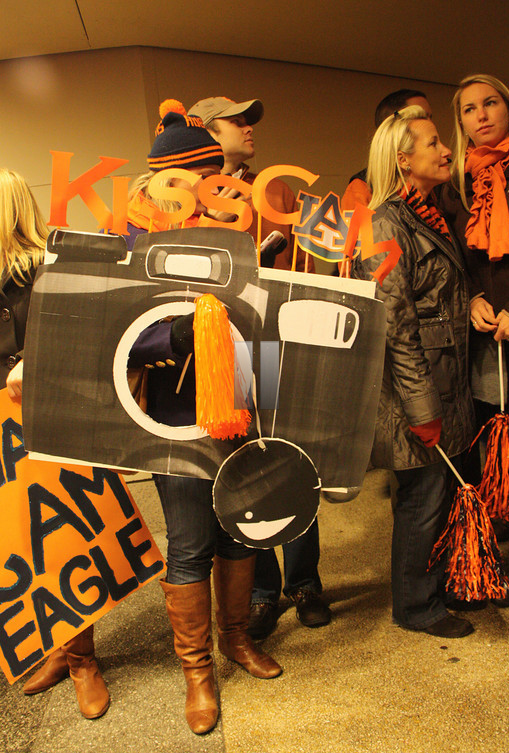 The turnout and exposure was a shot in the arm to an alumni club chapter that Klein says has in the past felt somewhat isolated from the Auburn family by distance. But Klein says it wasn’t as easy to pull off as it could have been; had it not been for Kleins’s connections with the Best Buy Theater (thanks to her job with one of the rock’s biggest booking agents) and a mysterious Auburn supporter inside the NYPD, things might have looked a little less impressive. Klein credits the do-it-yourself success of the event to the leadership of new club president Micah Latter. Mission accomplished: the Wall Street Journal ran an AP piece on the football flash mob (and its strange ‘shakers’) within hours of Newton’s appearance. Footage shot of the gathered Auburn fans was also included in ESPN’s coverage of the presentation. It also drew attention from the police. Heck and Co. receive an updated briefing from NYPD. The club’s original plan was to form an alley of fans – sans barricades – for Newton to walk through exactly as the team does when entering Jordan-Hare Stadium. According to Klein the club’s NYPD insider, as well as sympathetic theater staff, arranged for Auburn fans – and only Auburn fans, were others to have shown – to have access to a tunnel leading to a back entrance it was thought Newton might use to enter the theater. 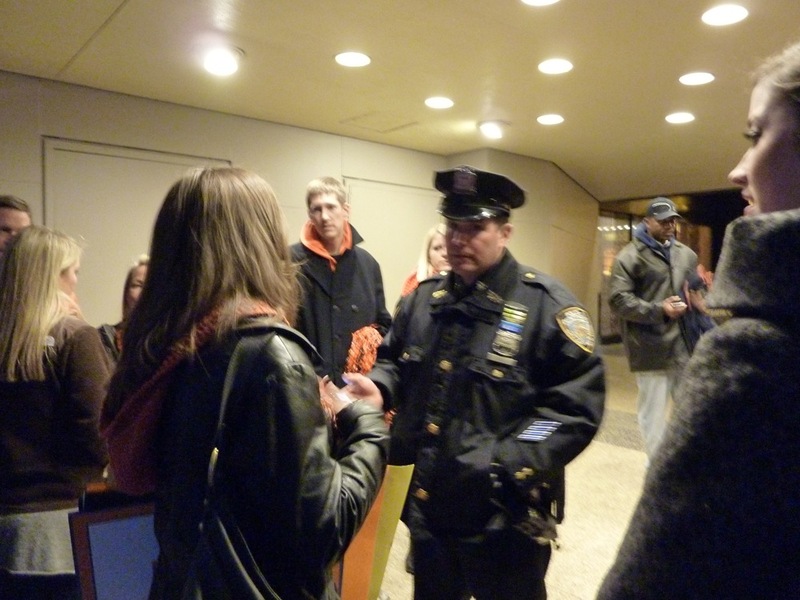 Chillin' with New York's finest... if you know what I mean. Still, when it was learned that Newton (and the other finalists) were going through the front door – and as the crowd continued to swell – in came the police barricades. To wit: Newton, Luck, Moore, and James were made to walk to the entrance of the theater twice, presumably because the shot wasn’t right the first time. Luck and Moore smiled, laughed, and shook their heads, she says. James looked unimpressed. Klein says a group of Auburn fans ran into James outside the lobby of the Marriott Marquis Hotel across the street an hour after the ceremony. 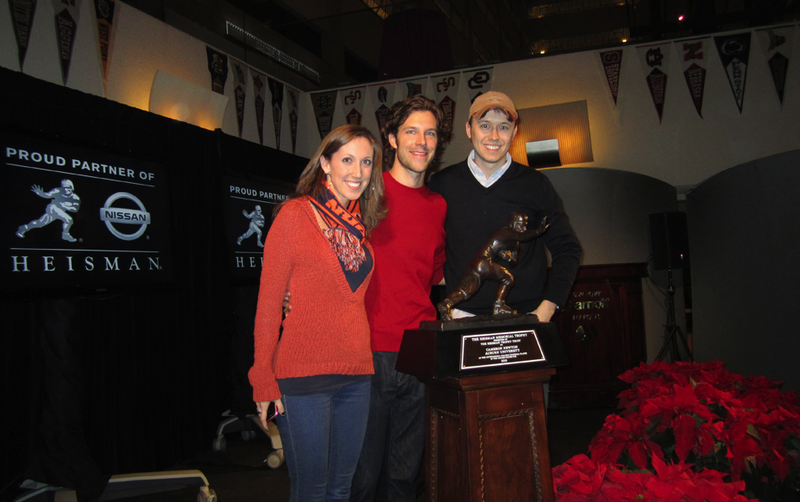 Nicole Klein and friends sneak a pose with the Heisman at an after-party at the Marriott Marquis. Heck takes it as a compliment. Photos via Nicole Klein, Ashley Heck and the great gallery of Tripp Johnson (there are tons more.. go there). War Eagle to all the NY Tigers! It was a great time. I came up with some folks from the DC club. You can see me to the left of the police officer in the third picture. We figured, you don’t get to go to a Tiger Walk on Broadway for a soon to be Heisman winner every day. And the drive is just four hours so why not? GREAT JOB NY TIGERS! WAR EAGLE! BIG war eagle to the NYC club and all those who made a special trip to make it a hit! Phoenix club the bar has been set high! Alright, so I’m bored. Just sitting here reading TWER and TET. Decided to play a lil T Pain in the background to really set the mood and it hits me. After the season is over we need to use all the tools of the interweb to get a remix of the intro song tailored to fit auburn. Since T Pain probably can’t find auburn on a map, much less pronounce it (I think he called it Awbren during his early fall concert…) we should push for a collaboration with T Will. This season has gone too fast. Seems like just last week we were bickering back and forth about the intro music winner. One theme we need to stick with though. Something in the music or video about AU winning alot. ’10 is “all I do is win” and ’04 the phrase “Auburn will rise” was prominently featured. I do miss that movie soundtrack instrumental music though. What do y’all think. REMIX! You guys are awesome!!! War Eagle!!! “it was bigger than what the Alabama fans did last year” – How uniquely Auburn. War Eagle! Ya’ll are crazy — what an awesome compliment! Definitely your mother’s daughter! So proud to have you representing us in NYC! WAR EAGLE!!!! WAR EAGLE to all you guys! Wish I could have been there but it’s a long trip from BR,LA @72 and flying is expen$ive. Great bunch of TIGERS we have. Thanks for a great year! P.S. My second favorite team is the NEW YORK YANKEES! WAR EAGLE NYC ALUMNI CLUB!!!!!!!!!!!!!!! I just read this terrific artcle today!! Still enjoying the “great ride” from last year!! WaaaaR EaGLE!! HEY! !